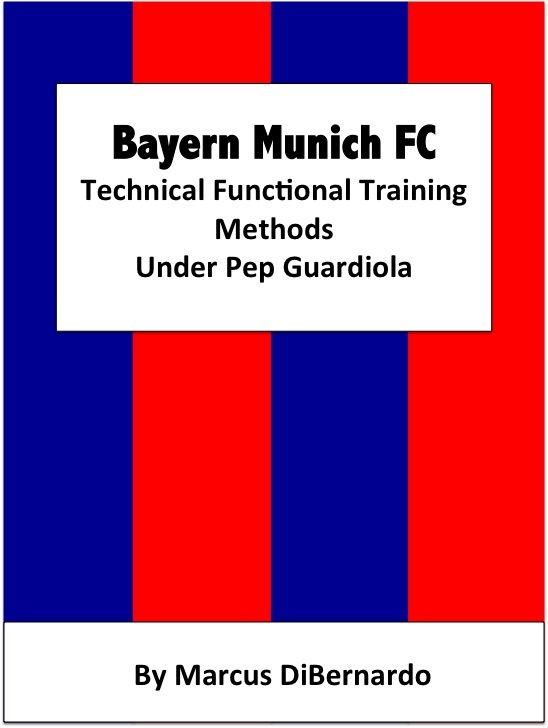 I am exited to bring you the latest training ground exercises right from the Bayern Training Ground & Pep! This first exercise is a great way to divide the field into 3 sections and work on finishing (3v2) and technical functional exercises to goal. The wide channels are working on explosive leaping, bounding, 1-2 combination passing, dribbling and shooting. The middle channel is working 3v2 to goal (can be done with 2 groups for a total of 10 players rotating every other repetition). The two outside channels will different so each group can rotate after 12 minutes. I ran this at training the other day and the players enjoyed it very much. If you do not have mannequins, coaching poles, various sized cones, speed rings, numerous goals or speed ladders – you will just need to improvise in order run Guardiola like sessions! Just be creative and you will be fine! The book includes everything from rondo, possession, 9v9, 4v4v4 to many technical functional exercises, passing patterns and more. A must read for sure. However, Pep is a very strict tactical periodization coach so if you have not read up on that you should do so. My book “Tactical Periodization: Made Simple – explains it in a quick simple way.